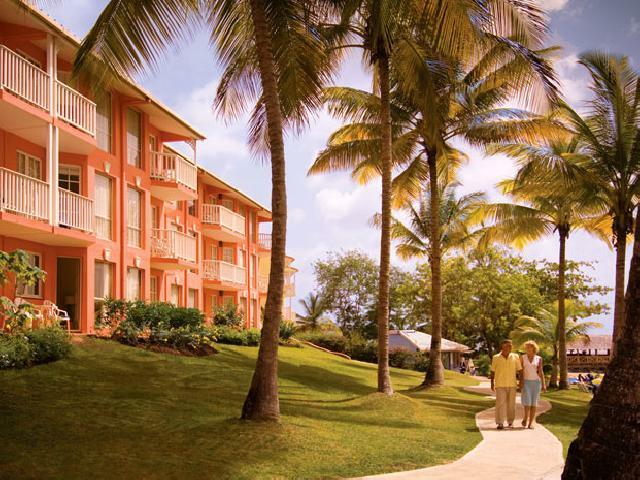 Escape from reality at the 4 star St. James Club Morgan Bay Resort, St. Lucia. 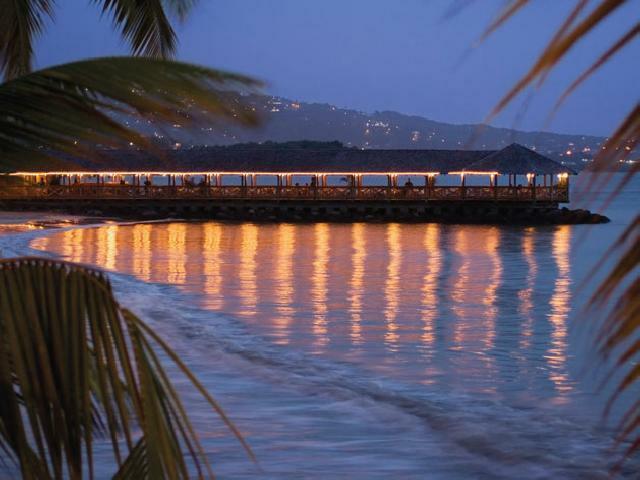 Tucked away on 22 acres against a backdrop of palm trees and a stretch of white sand beach cove, the newly refurbished Resort combines an elegant, but informal setting to offer singles, couples and families a high quality all-inclusive holiday in St. Lucia. 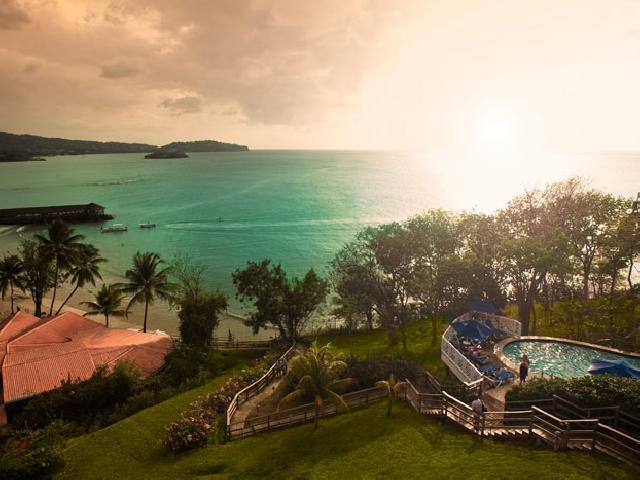 At St. James Club Morgan Bay Resort, the resort is nestled in a private cove and each room has spectacular views of the ocean. 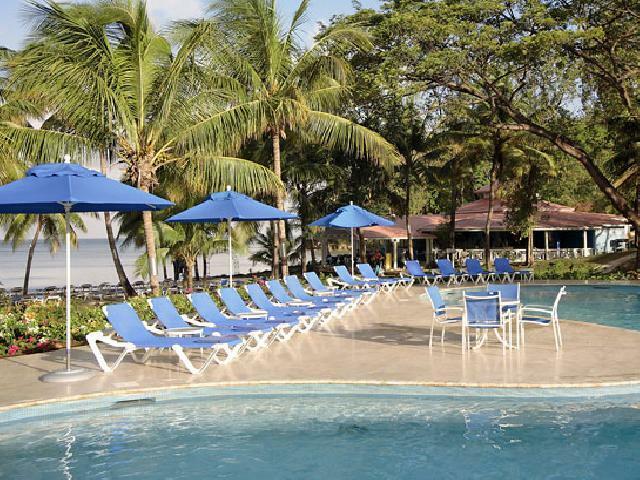 Fine dining, excellent accommodations, an array of land and water sports, amazing nightlife and children\'s programs await you. With Almond\'s all-inclusive package, you are welcome to enjoy all of these and more. 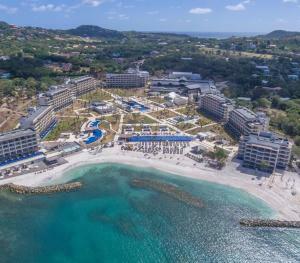 Located on the West Coast of St. Lucia, a mere 3 miles from the capital city, Castries, and about 25 miles from Hewanorra International Airport. Some of the activities Almond Morgan Bay offers are tennis and tuition, golf (discounted green fees on the nearby Cap Estate Golf Course), fitness centre and spa offering various treatments (at extra cost), and live entertainment nightly. Almond Morgan Bay offers canoes, kayaks, windsurfing, sail boats, aquatrikes, snorkeling, scuba-diving and hobie cats. There is a beautiful stretch of beach with loungers and 6 swimming pools, of which 3 are designated within the Kid's Club area. Beach towels are included and available at the watersports desk. Features new petting zoo. Supervised and open daily, new born to teenagers. 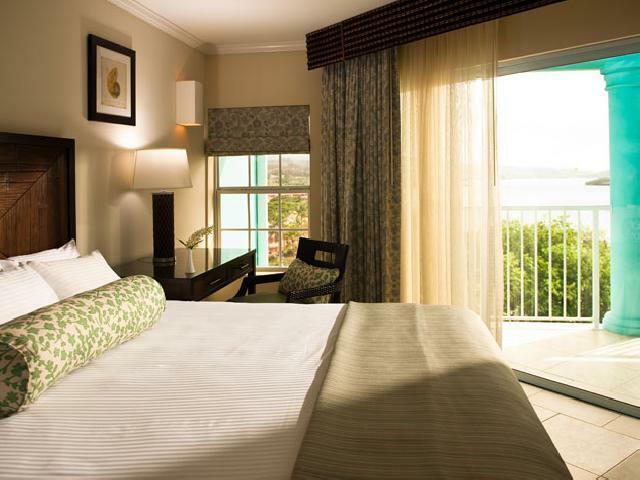 238 rooms in total, 6 categories located in blocks set in tropical gardens or directly on the beach. All newly refurbished rooms include balcony or terrace, air conditioning and ceiling fan, private bath and shower, in-room safe, king-size or twin beds (request), satellite color TV, hairdryers, tea & coffee making facilities, iron & board. Room service is available for lunch and dinner only. Includes Clergyman or Magistrate's fee, a decorated site, corsage for the bride and boutonnierre for the groom, a bottle of champagne and celebration cake. Includes bottle of champagne and two commemorative glasses, half hour massage or manicure or pedicure, room upgrade (space pending), fruit basket, candle flowers in room on arrival, celebration dinner for two and Certificate or Togetherness. Free all year round for stays of 7 nights or longer. Consists of normal government fees, registrar costs and ceremony charges; decorated site. For the wedding and reception; bouquet of local garden flowers for the bride and boutonniere for the groom; wedding cake, one bottle of champagne; all taxes relating to the above, manicure for the bride or groom, special celebration dinner for two with personalized menus, 8"x10" photo in engraved frame, breakfast in bed the morning after the wedding, decorated bedroom, turn down service. There are optional extras that may be added on to the package for a fee. Extensive work on the Resort will occur starting June 1, 2005 with completion on November 15, 2005. The Almond Morgan Bay Beach Resort willl have a selection of 3 gourmet restaurants serving breakfast, lunch and a la carte dinner. The three restaurants offer a choice of French 'Creole' cuisine, a continental restaurant and a seafood restaurant. There are 4 bars, all serving premium brand drinks, cocktails and soft drinks as part of the premium all-inclusive programme.